This basket has a length of about 8.5 in, a width of about 8.5 in, a height of about 1.5 in, and a Net WT. of 2 lbs. Watching carbs and keeping track of one’s sugar intake is a necessity for many these days. That’s why our Sugar Free Supreme Snack Basket is such a great idea for thoughtful gift-giving. On the one hand you have savory gourmet nuts of supreme quality, full of flavor and loaded with real health benefits; on the other, you have delectable sweet treats to delight anyone’s palate, but without the drawbacks that come with most sugary snacks. For anyone on a sugar free diet, the Supreme Snack Basket presents a stunning array of luscious delicacies guaranteed to meet with instant approval. 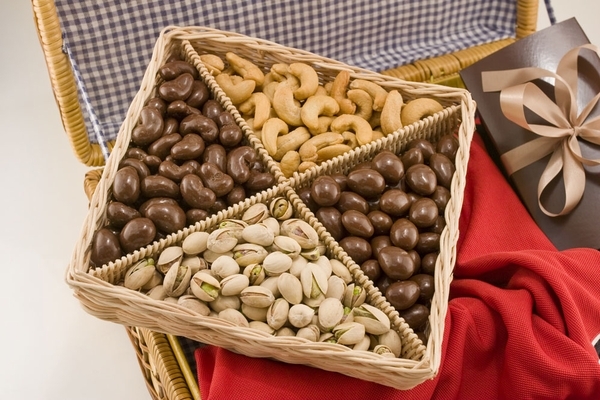 One of our top-selling diabetic gift baskets, the Sugar Free Supreme Snack Basket presents the perfect balance of flavors, featuring two of our finest gourmet nut selections plus two of our most popular sugar free chocolate covered nuts. The four favorites are juxtaposed in a custom 4-section basket to create a highly appealing display. Our Giant Whole Cashews are nestled opposite an impressive mound of Colossal California Pistachios, while our elegant Sugar Free Chocolate Covered Almonds sit across from an abundance of luscious Sugar Free Chocolate Covered Cashews. For the recipient, the question isn’t whether to reach in, but where to start! As a thoughtful giver, you don’t have to worry about any of our diabetic chocolate baskets or other sugar free gifts. The nut coatings are made in-house using an advanced sugar free sweetener that sacrifices nothing in taste and sweetness; the flavor is every bit as exciting as real sugary chocolate. The gourmet nuts in our sugar free gifts are specially selected for size and quality, and roasted on-site in small batches to the point of perfection to provide a delicious and healthy snack. We hop you’ll enjoy giving our sugar free gift baskets as much as your recipients will surely love receiving them! Giant Cashews (Cashews, Peanut Oil, Salt); Sugar-Free Chocolate Covered Almonds (Sugar Free Flavored Chocolate (Chocolate Liquor, Maltitol, Cocoa Butter, Sodium Caseinate, Milk Fat, Soy Lecithin (an emulsifier), and Artificial Flavor (Vanillin) Natural Flavor, and Salt), Almonds, Gum Arabic, and Certified Confectioners Glaze. This product may also contain trace amounts of peanuts and other tree nuts. Contains: Almond, Milk, and Soy Ingredients. ); Sugar-Free Chocolate Covered Cashews (Sugar Free Flavored Chocolate (Chocolate Liquor, Maltitol, Cocoa Butter, Sodium Caseinate, Milk Fat, Soy Lecithin (an emulsifier), Artificial Flavor (Vanillin), Natural Flavor, and Salt), Cashews, Gum Arabic, and Certified Confectioners Glaze. Contains: Cashew, Milk, and Soy Ingredients. This product may also contain trace amounts of peanuts and other tree nuts. ); Colossal California Pistachios (Pistachios, Salt). Good selection, good product, good service. What more could one want? ConsMy grandsons ate all of it before I could even get a "taste"!